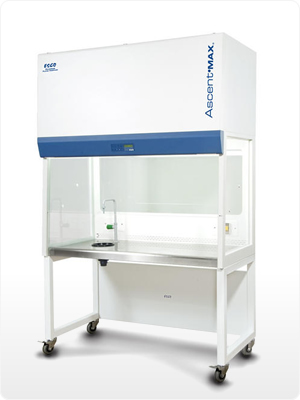 The Ascent Max Ductless Fume Hood with transparent glass back wall gives maximum visibility, ideal for classrooms and educational demonstrations. State of the art Sentinel airflow monitor and alarm system. Grade 304 stainless steel work surface that will never rust, chip, or generate particles. Lip at the front edge of the work surface ensures that any spillage is contained within the workzone. A fully configurable Sentinel microprocessor control with audible and visual alarms for unsafe conditions. Built-in 5000k warm white fluorescent lighting. Front service panel opens up easily for immediate access for all maintenance functions. Small Filter ID window to easily identify the type of filter being used. Powder-coated, panel-mounted single electrical outlet provision. Isocide antimicrobial coated structure eliminates 99.9% of bacterial presence on external surfaces within 24 hours. All cabinet service and filter replacement can be carried out from the front, allowing the cabinet to be placed against walls in the laboratory to save space. Electronic module behind the hinged front panel for easy access during troubleshooting and certification. Retrofit Kit service fixture for air/water/vacuum/gas outlets. Retrofit Kit Polypropylene drip-cup sink and epoxy powder-coated swan neck faucet. Exhaust collar for added operator safety. VOC sensor to monitor the chemical concentration within the cabinet workzone. Base cabinet and support stand accesories. Over 7 different Nanocarb carbon filter types, choose from: volatile organic compound, acid, mercury, sulphur, halogen, aldehyde or ammonia. Models include the ADC-3D1, ADC-3D2, ADC-3D3, ADC-4D1, ADC-4D2, ADC-4D3, ADC-5D1, ADC-5D2, ADC-5D3, ADC-6D1, ADC-6D2 and the ADC-6D3. Esco Ascent Ductless Fume Hoods provide protection to both laboratory personnel and the environment from toxic fumes and are quickly becoming a viable alternative to conventional fume hoods. Unlike conventional fume hoods, these hoods filter out chemical fumes and recycle air directly back to the laboratory, providing energy savings, personnel and environmental protection, convenience as you do not have to deal with complicated ducting systems, and mobility, since ductless hoods are independent systems which do not require connection to extraction systems. Esco ductless fume hoods are independently tested by INVENT-UK for the ability to filter contaminated air with efficiency and retention capacity as required by the British Standard BS 7989 and French Standard AFNOR NF X 15-211. Fume containment and airflow uniformity meet the requirements of ASHRAE 110-1995, BS 7258, EN 14175-3 and AFNOR NF X 15-203. The Esco combination of effective containment and safe carbon filtration opens new, cost effective applications for fume hood technology in laboratories of the 21st century.